This book presents recent advances by leading researchers in computational modelling of language acquisition. Sophisticated theoretical models can now be tested using simulation techniques and large corpora of linguistic data. Renewed interest in learning neural networks and the ability to test new solutions to fundamental problems has fuelled debates in an already very active field. The twenty-four authors in this collection of new work have been drawn fromdepartments of linguistics, cognitive science, psychology, and computer sciene. The book as a whole shows what light may be thrown on fundamental problems when powerful computational techniques are combined with real data. A central question addressed in the book concerns the extent to which linguistic structure is readily available in the environment. The authors consider the evidence in relation to word boundaries and phonotactic structure, stress patterns, text-to-speech rules, and the mapping of lexical semantics, one author arguing that a child's own output may serve as a key source of linguistic input. Linguistic structure environment relations are central to the debate on the degree to which languagelearning is inductive or deductive; this issue is considered here in studies of the acquisition of pluralization and inflectional morphology. 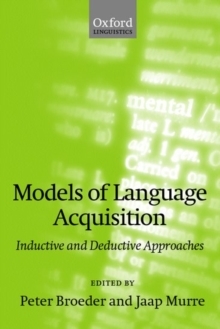 The book examines the power and utility of different modelling formalisms for different problems and approaches: how far, for example, can connectionist models be used as models for language acquisition? To what degree can lexical items and categories be used in the construction of neural network models or Markov chains be deployed to investigate the characteristics of a general language learning algorithm (Triggering Learning Algorithm)?This book will appeal to linguists, psychologists, and cognitive scientists working in language acquisition. It will also interest those involved in computational modelling in linguistics and behavioural science.